The Holiday Climax is over and our houses are overloaded with all the new gifts. This is a great time to talk about safety. There are people in the world who are on the prowl looking for cars, homes and business to break into. Many have new vehicles, and new tech in our homes and offices. This is too much of a temptation for the thieves on the block. They saw the boxes on the curb and now they want your hard earned possessions. In order to keep things safe right now, here are a few suggestions. Packages: Do not leave delivered packages unattended. If you are going to be away during a delivery, arrange for a neighbor to sign for it. Trees: Keep your trees watered and keep the lights unplugged overnight and when you are away. If you have your tree in your window, make sure you can still see your property from that window if it is the only window in that room. You need a view of your property at all times. Trash: After you have opened gifts, consider taking boxes to the local dump or recycling area. Thieves are on the lookout in the days after Christmas to see what boxes you discarded. This tells them if there are large items like computers, gaming systems, televisions and more inside. Trips: If you are going to be away during the holidays, notify your neighbors as well as your local police department. Many police departments will send a car to drive by if they have available officers in your area. Visitors: When yo have a knock at the door or the bell rings, you must be cautious, especially this time of year. Many thieves will pretend to be a delivery service or utility worker. If you have a home commutations system like the VTech Phones Audio/Video Door Answering System, you can verify who is at your door before you open it. 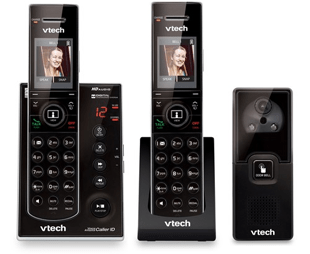 The Audio/Video Door Answering System from VTech Phones is just perfect for any family home or business. With its combination of doorbell, phone system and digital camera, you get a great home security system which is also affordable. This cutting edge product is the first of its kind and can give you a screening of who is at your door from the comfort of inside your home. If you can imagine what caller ID for your phone would be like if it were on video, this is what the Audio/Video Door Answering System is like. When someone rings the bell, the system will take a photo and send it to the handset of the phone. From there, you can stream a video or audio separately or simultaneously. You can push to talk to the visitor with the simple push of a button, the phone can store up to 50 numbers and save up to 100 photos. It has a backlit keypad and display, ECO Mode power-conserving technology and you can expand your system up to 10 handsets and 2 cameras. You also get all the convenient features of the telephone like call waiting, conferencing, mute, a digital answering system and you can use the handsets as an intercom within the home. Priced at just $120 from WalMart, protecting your home is much more affordable than traditional security systems. Be sure to stay current with the latest from VTech Phones and follow them on Facebook and Twitter. I would love the connect to cell headset with the cordless headset. Considering my cell is my home phone, and I also want to start working at home…I’d love something like that. I like the Careline Corded/Cordless Answering System with Pendant. this is an awesome idea that you can see who’s at the door. I like the VTech Retro Phone with Connect to Cell. I like the “2 Handset Answering System with Audio/Video Doorbell.” It would be very useful for my home. I like the connect to cell with caller id. I like the safe and sound color baby monitor with full tilt. I like the doorbell phones for myself and my family ~ perfect for apartment living! DEFINITELY the Audio/Video Answering System. I like the DS6401 phone. I would love one of their baby monitors. I think the 2 Handset VTech Retro Phone and and Cordless Bluetooth® DECT Speaker would be very useful for my family. I would like the Wireless Bluetooth® and DECT Speaker. The one you reviewed here would be the most useful to me. The 2 Handset Answering System with Audio/Video Doorbell would make me feel much safer! I’d love to use this door answering system! Id also love the BIG-BUTTON CORDLESS PHONE and other items for seniors for my MIL. The v tech product that i find most useful would be the 5 Handset Connect to Cell™ Answering System with Cordless Headset. The Audio-Video Camera Doorbell would be my first pick, but they have such great products it’s hard to pick just one! I think all the phones for seniors, connect to cell and the doorbell phones are very convenient, but I’d have to say I would get the most use from the doorbell phone system. It takes me a while to get to the door, so I could see who was there and ask them to wait if I wanted to talk to them. Thanks for a great giveaway and for letting us know what products V-Tech has to offer. I would get a lot of use out of the Accesssory Cordless Headset. I like to multitask while I am on the phone. Living in the Hollywood area, I never open my front door before finding out who it is. I can barely make out the distorted image of my peep hole and I double check if not expected anyone or a package. The doorbell phone would be great since I don’t have a doorbell and it would make me feel safer. what a great idea for security and convenience. The 2 Handset Answering System with Audio/Video Doorbell would be perfect for our home!